Deputy Prime Minister John Prescott has warned Labour MPs not to "get into a war" over the party's future. Mr Prescott said he still had a role in "cutting deals" in government despite losing departmental responsibility. It comes after Tony Blair sought to reassure the party over the leadership succession and as an opinion poll indicated a drop in support for Labour. The Populus poll in The Times suggested support for Labour was at its lowest level since 1992 at just 30%. It put the Tories on 38% and the Liberal Democrats on 20%. It also suggests Conservative leader David Cameron, who says the sooner Mr Blair goes the better, is preferred to both the prime minister and his likely successor, Gordon Brown. Mr Prescott, making his first public comments on his affair, said the loss of his departmental responsibilities looked like a knockdown, but it was discussed a year ago. He said the prime minister wanted him to "cut deals across government", adding: "If anybody feels that is not work they should come and see it. "This is a man who wants to get on with the job. I have to make sure that it gets done on time." Mr Prescott said a smooth and orderly transition was possible and he claimed everyone should work towards that goal. Colin Brown, Mr Prescott's biographer and The Independent journalist who carried out the interview, said the deputy prime minister had been "very chastened" by the publicity surrounding his affair. He said he had apologised to all those who work closely with him and felt "mortified" by the affect his liaison might have had on Labour's heavy losses in last week's local elections. "I've known him for 20 years and I have not seen him in this mood before," Mr Brown told BBC News 24. He said Mr Prescott had mentioned losing his department over the last nine years, adding that he had seen himself as "a sort of Whitehall enforcer". Downing Street insists that Mr Prescott "will be accountable to Parliament", but declined to say whether this involved answering departmental questions as the details were still being worked out. But shadow transport secretary Chris Grayling said research from the House of Commons library confirmed that Mr Prescott would be the first deputy prime minister since the Second World War not to have an official role, either as leader of the Commons or the Lords or with a government department reporting to him. 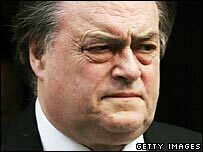 "This is further evidence that taxpayers are having to fork out hundreds of thousands in salaries and perks each year for John Prescott, even though unlike all his predecessors, he quite clearly doesn't have a proper job to do," he said. On Monday, Mr Blair rejected calls to set a date for his departure, saying this would "paralyse the working of government" but promised a "stable transition". At a meeting of the Parliamentary Labour Party, he told MPs he would give his successor "the time properly needed... to establish himself". He said he wanted his "legacy" to be a fourth term Labour government after his time as prime minister. He has previously said he planned to serve a "full term" of office. Some MPs were reassured by the prime minister, while others were still asking what he really meant, and urged Tony Blair and Gordon Brown to resolve the situation. Mr Brown told GMTV on Tuesday that the prime minister was now "going to talk to senior colleagues" about when and how the handover of power might happen. He said he believed Labour could "show the world" it could organise the power handover in an "organised, dignified, sensible and proper way" which would be "unifying as well as unified".